I’ve spent the past three weeks spinning my wheels. There were three projects I wanted to start. Each of them felt equally important and ambitious. It seemed crazy to start all three at once. Current thinking tells us that multitasking isn’t effective. Plus, there is the business side to consider: the sooner I complete a project the sooner I can earn from it. So round and round I went trying to figure out how to prioritize the three. I tried looking at the situation logically, I tried ordering them by earning potential, I tried to decide which could be completed in the quickest manner so I could move on to the other two. I considered current markets and which project might have the most appeal. I asked friends for advice. I thought about scheduling an appointment with my business coach. I wondered if I should just put the choices in a hat and pick one. Then one day, I was due to meet a colleague for one of our “strategy coffees” and I was excited. Maybe she could provide the solution. For some reason, she didn’t show up. I was disappointed. There, perhaps, went the answer to my dilemma. In the end, it turned out to be a good thing she missed the appointment, because across the street from the coffee shop is the university’s test garden. It was such a beautiful, sunny afternoon, and the plants were in full bloom, so I decided to go for a stroll. I passed row after row of neatly planted flowers in every imaginable color. I paused now and then to read the names, Electric Sunshine and Limerick Isabella, and then my gaze was drawn toward a corner of the garden. “What’s that?” I said aloud, and beelined for the section. 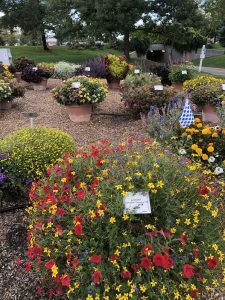 There I found large, round planters filled with various types of flowers of all shapes and colors mixed together, growing in abundance. No neat and tidy rows, just a jumble of blossoms tossed together. And the site of it made me happy. Ever since I was a child, I’ve gravitated toward colors mixing and overlapping. When I moved closer to read the sign, it said “Combination,” and my heart sighed with relief. I made my decision at last. I’m going to work on all three projects at the same time. It feels the tiniest bit overwhelming to be in the early stages of three creative endeavors at once, but mostly it feels exciting and promising and right . . . It feels right.